Nancy Stang has physical therapy skills, safe cracking skills, an old dog named Bee and a commitment to providing good service at a fair price. 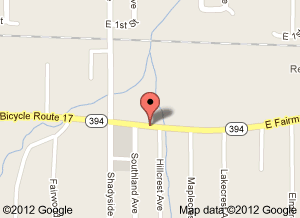 She’s everyone’s favorite locksmith at Austin Works, located at 167 E. Fairmount Avenue in Lakewood, NY. The fact that she is the only locksmith at Austin Works is just a minor detail. She’s owned and operated the shop since 2008 when she bought it from Kevin McGill. Nancy, as she prefers to be called, is a physical therapist, graduating from Daemen College in Amherst, and didn’t know much about locksmithing when she began to consider a career change. She “shadowed” Mr. McGill to learn, and was intrigued. So she bought the place. 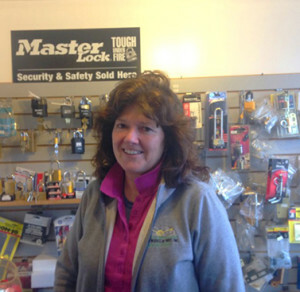 There are about 200 locksmiths in New York State, and although they are not required to be licensed as they are in some states, the intricacies and complexities of keys, electronic keys, key pads, safes and other security devices means that Nancy attends training seminars several times a year. And she maintains a network of distributors, manufacturers and other folks in the trade who call on each other with tricky issues.